I have been doing a few things with my nails yet I've failed to post the results so here we go. 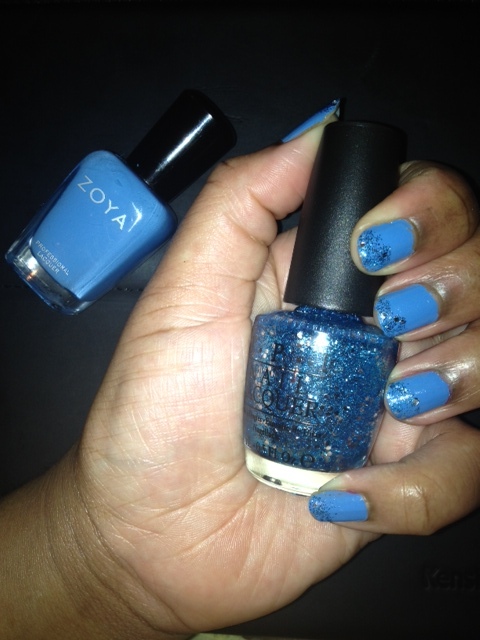 One week I applied Zoya's Dree over my nails as shown below. This is a one coat really opaque polish. 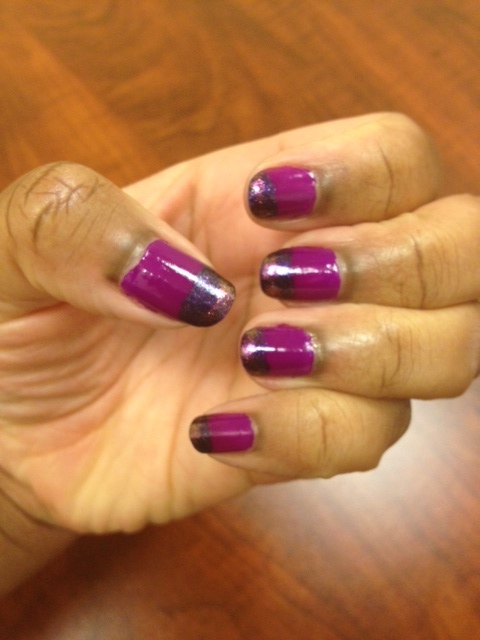 But that wasn't enough so I decided to throw on a very sheer Zoya color named "Manhattan" over Dree. It is a sparkly polish without that hard to remove glitter. I tried this whole ombre effect and ummm yeah I need help but you can at least take a look and maybe even a laugh at my attempts. First I did a purple look using the color Charisma from Zoya as the base coat, then the dark purple towards the top is another Zoya color in Jem, then the very tip of my nail is an Orly color named Space Cadet. Sorry I didn't have the pics of the bottles of polish. My next failed ombre attempt came with I used Yummy by Zoya and then placed a sparkly blue polish from the OPI Muppet's collection named Gone Gonzo. Now I am wearing an iridescent gold green from the company named Ciate. They are the makers of the caviar manicure which I would love to purchase but I don't want to spend $25- ok I'll admit it, sometimes I can be a cheapo..lol. I guess I should think of it this way, for $25 I would be getting a bottle of nail polish, the actual nail beads and a funnel used to apply the beads. How much is too much for polish? 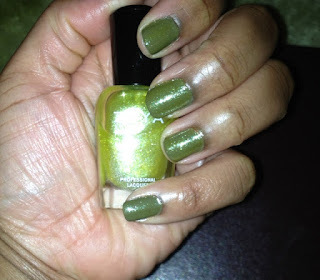 If you haven't see the caviar nails, I will post a pic below but for now, let's get back to my golden green nails. With just the slightest movement from my fingers my nails go from gold to a shade of goldish green-lovely. The name of the color is oil slick. 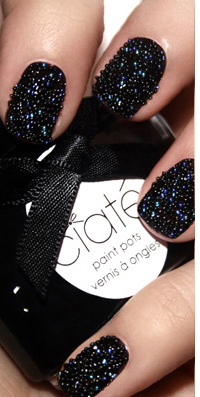 Now here is the caviar manicure- pic courtesy of the Ciate website. On another note, I can't get enough of Scandal. Although i didn't like the fit of Olivia's pants last night, I do appreciate the twists and turns of this made for tv drama. When Olivia get's right in someone's face and ever so calmly explains how she will destroy the person, I get warm and fuzzy inside..lol "It's my name on that door." I heard that OOOOOlivia!!!! If you haven't watched the show yet, please check it out online to catch up and then WATCH each new episode. In other news, I can not stop listening to this song! Thanks so muvh Blessed Tresses! Okay. First, I applaud your adventurousness. I really like the green Zoya and the Ciate color. Really nice. I actually like that blue also. I'm not really into the Ombre nails so much, but that Caviar polish is SICK. Love that! Cant wait to see your follow up on that one.